Lighting technology has come a long way in the past ten years and I can now proudly say we are beyond incandescent lights in our home. Today, I swapped out the last two incandescents with LED bulbs that Alicia won in an Earth Hour Facebook giveaway from Philips – EnduraLED 12W 2700K A19 Dimmable lamp . Wait! the Hunts still used incandescent lights? That’s correct. We had two light bulbs left that we had not replaced with compact fluorescent lights (CFL) or light emitting diodes (LED). Both were in our toddler’s room. One was in a table lamp we used less than an hour a day for reading bedtime stories. Because CFLs contain a trace amount of mercury and this is a very energetic toddler’s room, the energy savings was not worth the risk of the toddler breaking the CFL. The second incandescent bulb was in his overhead light. This location wasn’t a concern for breakage, but rather we need this fixture to be dimmable as part of his bedtime routine. A good dimmable CFL only dims to about 40% of full brightness, where an incandescent or LED can get down to under 10% which is key for keeping enough light to change cloth diapers, etc.while being dim enough to create a calming atmosphere. Also, when we tried putting a dimmable CFL into this fixture last year, the hum from the old style magnetic ballasted dimmer switch was very annoying. Of course it took winning a 6 pack of free Philips EnduraLED 12W A19 lamps to make this switch happen. As nice as quality LED bulbs have become, they are still very expensive, often around $20 per bulb. That makes them only practical in lights that are used for at least several hours a day (or in fixtures where the bulb is very difficult to replace since they have a long 25,000 hours lifetime). I put the other four LEDs in our kitchen fixture because these are the lights we use most in our home. I am very impressed so far by the quality and color of the light from these the Philips EnduraLEDs. Even though the bulbs have a funky yellow color when turned off, they produce a nice warm white light when illuminated. Alicia didn’t even notice that I had swapped them in the kitchen already. I am also happy to report that the hum from the dimmer in our toddler’s room, which was unbearable with a dimmable CFL, and noticeable with the incadescent light bulb, is now gone with these dimmable LEDs. I may even put a dimmer switch back into the kitchen – we had swapped that switch with a standard light switch years ago when we first installed CFLs. LEDs continue to be expensive, but the prices have come down significantly over the past six months and I expect will continue to become more affordable and practical. While I wouldn’t recommend replacing all your CFLs with LEDs, you may find them to be the perfect solution for those one or two locations where CFLs just don’t work well enough. Attention Massachusetts Residents – EFI is offering the next generation of the Philips EnduraLED, which won the L-Prize for $25 through a time of sale utility company rebate. Click on your utility provider in the Product Rebates section on the right hand side to see what is available in your area. p.s. Thank you Philips for the lamps without which it would have probably been many more months before we would have moved completely beyond incandescents in our home. Previous Post: Being Part of a Guinness World Record™! Great Cloth Diaper Change! I’m impressed, I have to say. Actually hardly ever do I encounter a blog that’s each educative and entertaining, and let me let you know, you will have hit the nail on the head. Your idea is outstanding; the problem is something that not sufficient individuals are speaking intelligently about. I am very blissful that I stumbled across this in my search for one thing regarding this. 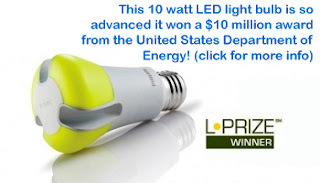 I wonder how much you have saved on your electricity by using the LEds? Is it worth the switch? How long does it take to make up the difference in cost of the bulbs? I can say that LED lights are energy saver. I’ve been using this product for quite some time now. It does not only give a big saving, but it does also give an additional beauty when used as outdoor lighting. I am a fan of LED lights. In fact, the LED lights such as led emergency vehicle lights and LED light bars are being used by many companies and vehicles for emergency purposes. These products also reduce the incidence of road accidents. They are not only an energy saver, but a life saver as well. I’ve since installed 50 of the 10w LED bulbs from Philips in my church and we are thrilled with the results. We did have to get more modern dimmers to get them to dim correctly with 12 bulbs per dimmer.